Photograph of “The House of the Future” (1956), a full-scaled installation designed by Alison Smithson, in collaboration with her husband Peter Smithson, for the Daily Mail Ideal Home Exhibition in London and Edinburgh. From the very beginning of her career, Jones had stretched those boundaries, pushing her stories in new directions. A contributor’s note remarks that Jones had “been successful in selling her ‘offbeat’ fiction” and, in fact, the five stories that launched her writing career were published in science fiction magazines. One of those stories, “Created He Them,” has been resuscitated by critics in recent years and is now considered a classic. (Readers may note eerie and prescient parallels to The Handmaid’s Tale.) 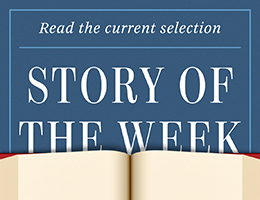 The story has been included in the new Library of America anthology, The Future Is Female: 25 Classic Science Fiction Stories by Women, and we present it here as our Story of the Week selection.